More than 60 students from The University of Texas at Austin are pedaling from Austin, Texas, to Anchorage, Alaska, as part of the 15th Anniversary of Texas 4000 for Cancer. The event is the longest annual charity bike ride in the world. The team will ride more than 4,000 miles over the course of 70 days beginning June 1, with the mission of fighting cancer by sharing hope, knowledge and charity at every stop along the route. The Texas 4000 team will be rolling through Lincoln City on July 11, just 40 days after departing from Austin, Texas on their way to Anchorage, Alaska. Texas 4000 is more than an endurance ride for cancer. It combines leadership development, physical training, cancer awareness outreach, volunteer opportunities and philanthropic commitment. All students undergo an application process to be part of the 18-month program and once selected, each student is required to raise $4,500, ride 2,000 training miles with his/her team, volunteer more than 50 hours in the community, and play an active role in planning every aspect of the ride to Alaska by attending weekly meetings and taking leadership positions within the team. Over the years, more than 750 students have made the trek from Austin to Anchorage, collectively raising more than $8.4 million in the fight against cancer since the ride began in 2004. Shortly after their return to Austin, the riders will celebrate their journey at the Tribute Gala on Friday, August 24, at the Hyatt Regency. Tickets and sponsorships are available on the Texas 4000 website. ● Sierra Route: These riders head northwest from Austin and cycle through the Southwest to California, then north along the West Coast and into Canada. Major cities along the route include: Santa Fe, NM; San Francisco, CA; Portland, OR; Seattle, WA; Vancouver, B.C. ● Rockies Route: These riders cycle north from Austin and cut over to the Rocky Mountains. They’ll ride through the western U.S. before crossing the Canadian border into Alberta. Major cities along the route include: Dallas, TX; Oklahoma City, OK; Denver, CO; Calgary, AB. ● Ozarks Route: These riders travel east from Austin, then cut northeast through the American Midwest before crossing the Canadian border and cycling across four Canadian provinces. Major cities along the route include: Houston, TX; St. Louis, MO; Chicago, IL; Minneapolis, MN; Madison, WI; Winnipeg, MB; Edmonton, AB. In Canada, the three groups will reunite and ride the final 10 days together to Anchorage, Alaska. On each of the three routes, the riders will make stops along the way to present grants to cancer research and support service organizations such as MD Anderson Cancer Center, Young Adult Cancer Canada, Brent’s Place and Texas Children’s Hospital. Texas 4000 for Cancer is a nonprofit organization with a mission to cultivate student leaders and engage communities in the fight against cancer. 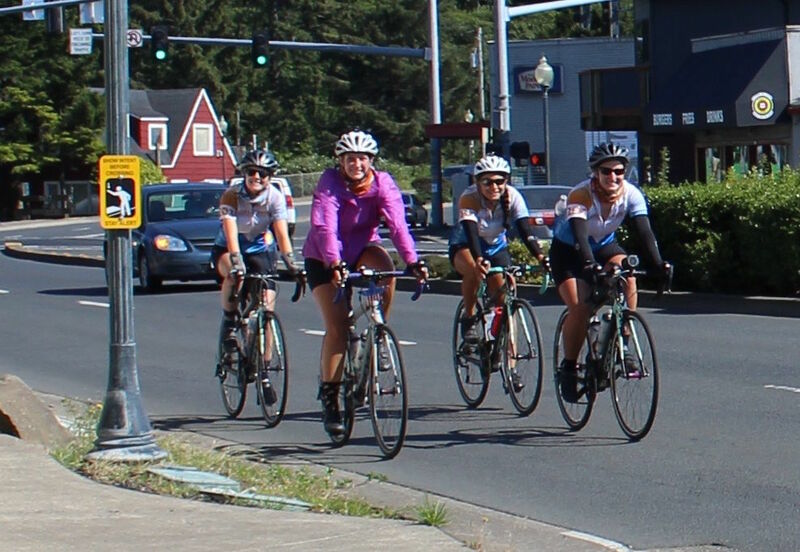 Each year a team of dedicated University of Texas at Austin students complete a more than 4,000-mile bike ride from Austin, Texas to Anchorage, Alaska sharing Hope, Knowledge, and Charity along the way. Over the course of their 18-month involvement with Texas 4000, riders train, fundraise, volunteer in the community, and serve in leadership roles to help plan every aspect of the summer ride. The leadership development program culminates in Texas 4000’s capstone event, a 70-day summer ride – the longest annual charity bike ride in the world. Since 2004, 751 students have completed the ride, raising over $8.4 million and logging 4,270,000 miles – fighting cancer every mile. For more information, visit at texas4000.org, facebook.com/texas4000 or twitter.com/Texas4000. Read the original article by The News Guard HERE.